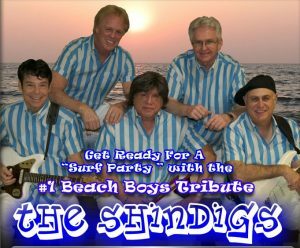 The most awesome Beach Boys Tribute Band! The early sixties brought bikini beach goers, hot rod muscle cars, and surfing to a new level. Nobody brought that new happening scene to the forefront like the Beach Boys! It was American culture at its best. Relive the happy days of the past as you sing along with this Surf Party Tribute. a world class five piece band with members having played for Disney at Epcot and on event stages and top venues! Have fun, fun, fun at your next event! Entertainment Direct Global, a division of Peter Duchin Music of Naples, Inc. Contents of this web page may not be copied and/or reproduced in whole or in part © Edpromo.net 2019 All rights reserved.